Editor’s note: OK, OK, already! The commenters have spoken, and you know what? They make some totally valid points. This article, which was originally part opinion piece, part tech guide, has drawn the ire of many a homeowner whose only option is to mount their TV over their fireplace. It was never intended to make anyone feel bad about this decision, only to encourage folks to seek an alternative because, at the end of the day, we still maintain that it’s something to avoid if you can. With that in mind, we amended this article to take into consideration several different scenarios and to provide some helpful suggestions if, ultimately, you must mount your TV over your fireplace. The practice of mounting a TV over a fireplace has somehow become extremely popular in the U.S. Even if you’ve never done it yourself, chances are very good that you know someone who has. Whoever it was that first thought up this idea and why they found it appealing in the first place are two mysteries that will likely follow us to our graves, but that’s all in the past now. Since science has yet to crank out a functional time machine that would allow us to preemptively ground the idea before it ever took off, the best we can do at this point is try to persuade you, dear reader, from perpetuating this practice. Is putting a TV above your fireplace really that poor an idea? Well, it depends. If you can avoid it, you should, and we explain why below. If you absolutely must, there are a few things you will want to know, and a few tips we can offer to help make it the best possible viewing experience. Electronics don’t care for heat, and they care for smoke even less. Have you ever seen the windows inside the car of a cigarette smoker? Unless the smoking driver is an equally habitual window washer, those windows are covered with a hazy film of filth. Exposed to the smoke of burning wood, the same film can build up on the components inside the cabinet of a TV. After all, there’s a reason so many eBay listings mention that the item you’re bidding on comes from a smoke-free home. You may not see the particulate when you have a fire, but it is there (you can smell it). If you burn wood — even with the flue open and fully functional — there will be a small amount of smoke and particulate emitted. And once that particulate builds up, so does the heat generated by the TV. Look at a wood-burning stove as an example. The heat generated by this is enough to melt candles placed several feet above the mantle — after all, generating heat is what it was designed to do. Think about what that same heat can do to all the sensitive components inside a TV. Neck headaches become a problem when you start protruding your chin forward with that “looking up” posture. Most electronic devices simply operate best and most reliably at lower temperatures. Beyond that, excessive heat can cause temperature-sensitive materials to degrade quickly, and conductive materials can even sprout little metal whiskers, causing shorts within the TVs circuitry. However, if you have a more conventional wood-burning fireplace — and especially if you have a gas fireplace insert — the fact is you are probably going to be just fine. That TV may die earlier than it had to, but you will probably replace it before it dies anyway. This is an issue we experienced many times ourselves as a guest at friends’ houses and various vacation rentals. We’ve also heard complaints from many others. Still, we are informed that, for some of you, neck pain from watching an elevated TV has never been a problem. If you are in the latter camp, please feel free to move right along, and congratulations on your superior spinal support. For the rest of you, please read on. 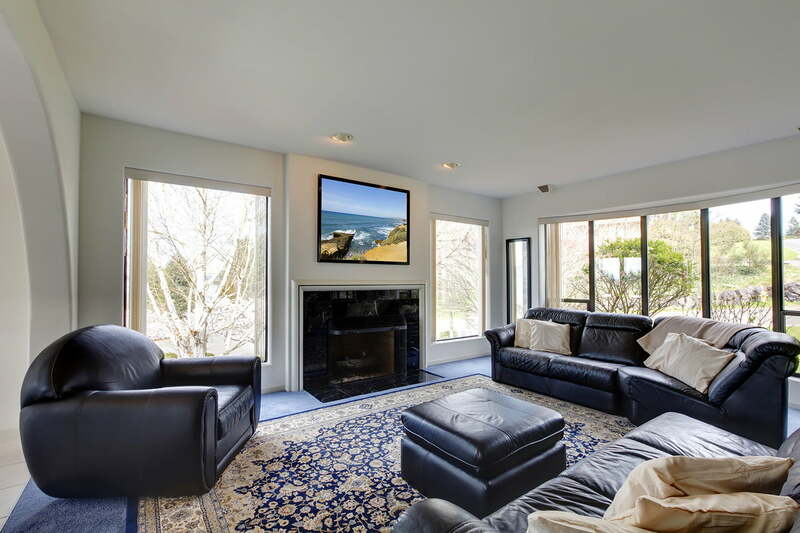 Placing a TV above a fireplace moves the image you’re trying to watch well above eye level. Think back to the last time you went to the movie theater and had to sit in one of the front three rows. Chances are you walked out of the theater with a stiff neck. Craning your neck into an unnatural position for an extended period of time is going to cause temporary discomfort, but doing so for even short periods of time, day after day, can have lasting effects, like chronic headaches. We spoke to Brad Simpson, a physical therapist and clinical director at Life’s Work Physical Therapy. Simpson’s clinic treats patients with multiple types of musculoskeletal problems and he is an expert in ergonomics, He says that repeatedly sitting in an unnatural position will have lasting repercussions. Muscle pain isn’t the only thing you can suffer from. Headaches are a huge problem in our population, and neck headaches become a problem as well when you start protruding your chin forward with that “looking up” posture, Simpson said. He also indicated this poor posture leads to improper breathing, which causes us to overuse certain muscles, which become yet another source of pain. The main takeaway from our interview: It’s not worth the pain. On this issue, there is no debate. We review multitudes of TVs every year, and the viewing angle on LED/LCD TVs remains a big problem, even among top-tier TVs. An LCD screen (which is what you find on “LED” TVs) is essentially made up of a bunch of tiny, shuttered windows. These windows open and close in order to let the TV’s backlight through, thus creating an image. The problem with these windows is that they have a very limited viewing angle. If you move too far left, right, up, or down. you start seeing a fraction of the produced light. The result is a washed out, lifeless picture — hardly what you had in mind when you laid out hard-earned cash for a new TV. The result is a washed out, lifeless picture — hardly what you had in mind when you laid out hard-earned cash for a new TV. The good news here is that you do have some options to mitigate this problem. The first is to buy a tilting wall mount with enough down angle to give you a more direct view of the screen. There are even mounts that will drop the TV down closer to your eye level (make sure not to have the fireplace going, though). Either option will improve both color saturation and contrast. The second option is to purchase an OLED TV, which has a nearly infinite viewing angle and will look amazing no matter how high you place the TV. There are plenty of other reasons why OLED wins in an OLED vs. LED TV battle. If an OLED TV isn’t an option for you, consider an LED TV that uses an IPS LCD panel. Again, though, most modern homes have rooms built around this idea. Hullinger told us about 25 percent of the homes he has walked into had one location that was wired and ready for a TV over the fireplace. Sevigny echoed that estimation when he told us that almost all of the new construction he has seen “will have electrical and coax connections already installed above the fireplace.” We can think of only one way that would significantly diminish the inherent ugliness of a big, dark rectangle floating above your mantel: Buy a TV that can do double-duty as an art frame when you’re not watching it. Samsung’s two models of lifestyle TVs, the aptly named The Frame, and The Serif can both display a wide variety of artwork, or information screens, when not in use. If your fireplace wall has an especially unique appearance, you can even mirror that look on the screen instead. But I have to (or want to) anyway. What can I do to make the best of it? In an ideal world — and, granted, we tend to be TV snobs, so our viewpoint is slanted — you would place your TV in another room purpose-built for enjoying TV, and maybe make music the focus of your main living area. However, most homes just aren’t designed that way, and your priorities are likely vastly different than ours. If you like the idea and look of mounting your TV over your fireplace, or if you simply have no other choice, here are a few suggestions to make the best of it. Sit further back if you can: As you move away from the TV’s location, the severity of the angle at which you must crane your neck is reduced. Lounge it out! Kick back and relax when you watch TV. You will eliminate the need to crane your neck entirely. Use a tilting or motorized wall mount: Altering the TVs angle to get a more direct view of the TV will improve picture quality. Purchase an OLED TV: In addition to providing an outstanding picture and a super-thin profile, OLED TVs have no viewing-angle problems. Just beware that, as mentioned above, electronics aren’t exactly fond of heat and smoke, so be extra careful with your pricey new OLED. Don’t have a fire and watch TV at the same time: The flicker of the fire and added brightness in a darkened room can play with your pupils. and strain your eyes while watching. It’s also a bit of a distraction. If the two are close together, perhaps enjoy just one or the other at a time. Hire a professional installer: Not only will a professional be able to handle cable management for a clean install, they come armed with other helpful suggestions to make the most of your TV installation.